Milan (Italy), 6 November 2013 – Last night in Milan, during the Metzeler Legendary Knight, Metzeler presented a preview to the international press and the many motorcyclists who flocked to the event, the new supersport SPORTEC™ M7 RR tyres and custom touring ME 888 MARATHON™ Ultra in a Whitewall version and new 23 inch front size and did it along with special guest stars, as well as friends of the brand of the blue elephant Steven Tyler, Aerosmith frontman and Dirico Motorycles USA spokesman, and Guy Martin, British road racing icon. 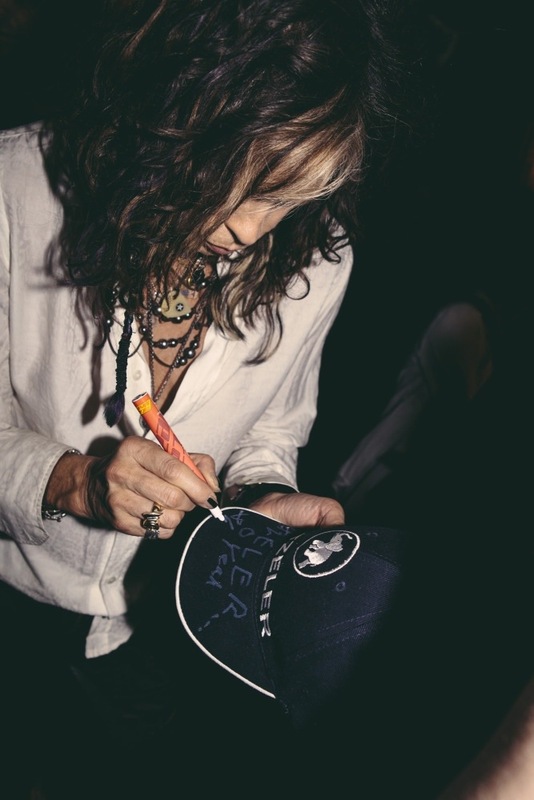 Steven Tyler, as Dirico Motorcycles USA spokesman together with Mark Dirico and Stephen Talarico, literally captured the attention of the audience in the hall talking about his passion for two wheels and about the motorcycles brand he represents. 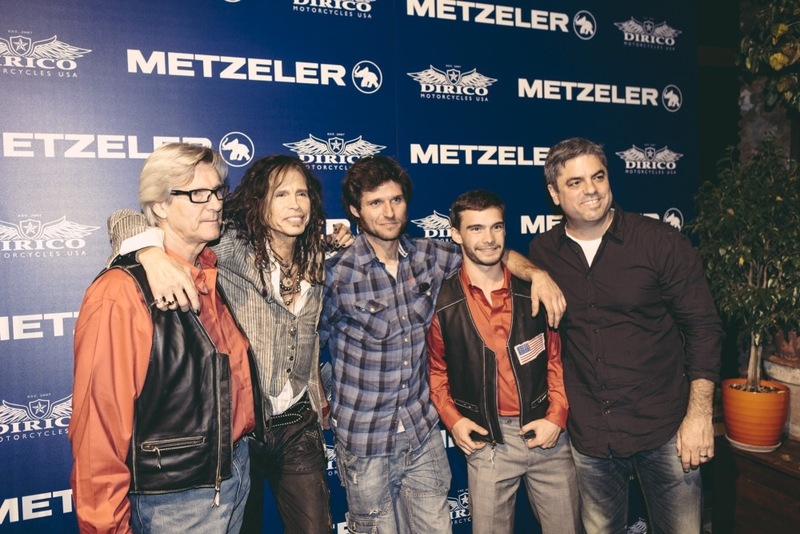 He also expressed words of praise for the new ME 888 MARATHON ™ Ultra tyres and for Metzeler, exclusive tyre supplier of Dirico motorcycles USA, a brand founded in 2007 and specialized in creating custom motorcycles. Guy Martin, who has been the godfather of the new SPORTEC™ M7 RR tyres, has spoken of his fruitful collaboration with Metzeler within the roadracing competitions and its contribution to the development of this new product born from the experience and know-how acquired in these years by Metzeler in roadracing activities. 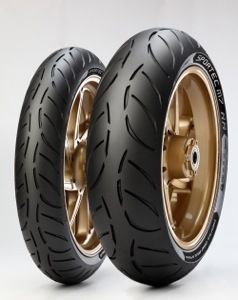 The range of METZELER tyres expands from Spring 2014. Coming the SPORTEC™ M7 RR, the new supersport tyre developed from the experiences of the German brand in roadracing activities, from which the RR designation. It has been designed to deliver high levels of handling and safety, ensuring optimal performance even in difficult situations that you may encounter on the road such as wet, bumpy and dirty tarmac. SPORTEC™ M7 RR provides a new level of supersport performance adapting perfectly for road use and is designed for all riders who prefer a sporty riding style and use the motorcycle in varied situations, every day commutes as well as for short trips during the weekend, and that always require grip whatever the road conditions, the weather and the temperature. SPORTEC™ M7 RR in addition to the important feature of grip on wet also features ease of handling and ensures a higher mileage than its predecessor SPORTEC™ M5 INTERACT™. News also in custom world: a wider range of sizes and a new version of the ME 888 MARATHON™ Ultra, the new tyre from the brand with the blue elephant, dedicated to all owners and lovers of V-Twins and the custom world will be made available. The new product, already nicknamed “Triple 8” from the US public, will be present with new sizes, including the 23-inch front, and with a Whitewall version. The 23-inch front is an unprecedented size in the range of products from METZELER dedicated to the custom world, which demonstrates the desire of the brand to continue on the road that led it to success, especially in the United States, that is the role of best partner for customisers, such as Dirico Motorcycles USA. The new front size is especially dedicated to those who want to transform their motorcycles into baggers and by customizing their own vehicle, do not only want to obtain a motorcycle for exhibition but use it on the road, all this through the quality of METZELER tyres. In the Whitewall version, which joins the “classic” one, ME 888 MARATHON™ Ultra includes 12 sizes, 5 front and 7 rear, which can fit the most popular models of heavy tourers, V-Twins and metric cruisers offering the same performance of the equal “blackwall” sizes and at the same time a vintage look carefully finished.